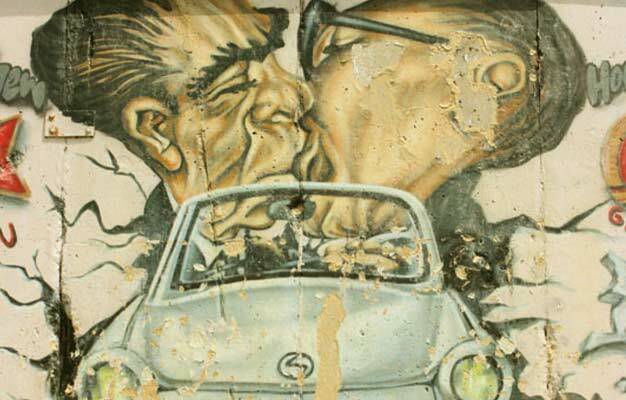 Our Berlin Wall and Cold war Bike tour takes you into the darker side of Berlin’s history. This 5 hours bike of approx. length of 14 km tour through Berlin shows you how the Berlin Wall and the Cold War had a huge impact on Berlin. Book your tickets here! Our Berlin Wall & Cold War Tour heads east along the imposing Karl-Marx-Allee before taking in the colorful East Side Gallery (a kilometer-long stretch of still-standing Wall, famous for its graffiti) and the powerful Treptower Park Memorial(More than 3200 fallen Soviet troops are buried here and the reliefs lining the memorial are the finest of Stalinist propaganda. It‘s off the beaten tourist path – yet quite accessible by bike). From there we return through the former no-man’s-land deathstrip to visit former checkpoints and hear tales of espionage and escape attempts. To put the Cold War into perspective we’ll timeline other important worldwide events to show how these effectively put Berlin at the forefront of Cold War tension. We break for lunch at a nice café in the remains of an old train station split by the Wall . Lunch and drinks for lunch is NOT incl. in the ticket price! As Berlin is a very big city and also very flat, Berlin is perfect for sightseeing on a bike. So join our Berlin Wall & Cold War Tour and see Berlin from the best way – on a bike! - The tour operates rain or shine, so please wear clothes according to the weather. You can rent rain ponchos available from the guide for €1 each! - Children must be able to bike their own bike to participate on this tour! - Berlin Wall and Cold War Bike Tour starts and ends at the TV Tower on Alexanderplatz in Berlin. April to October: Monday and Saturday at 10AM.